La Tête is modeling the third and latest of the unintentional red hat series. This is the gift I couldn’t post a pic of the other day. 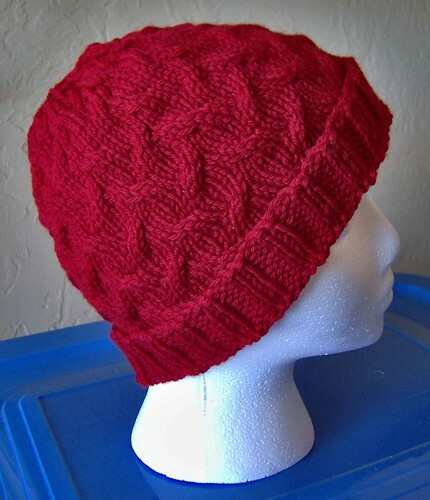 The hat was made for Donna and is knit using Cascade 220 and the Smariek Knits pattern, Cap Karma Hat. I also used the Brooklyn Tweed modifications in the crown decreases. 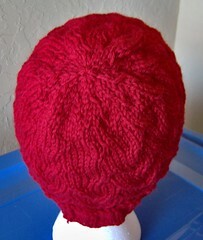 I did one more pattern repeat in the body of the hat because it looked like it would be too short. Turns out it wasn’t needed, but now D has the option of wearing the hat pulled down lower over her ears or a little shorter by rolling up the ribbing section. Did you feel the earth move?…. … And I’m not talking about the mini quakes we’ve been having around here lately. I actually stepped foot in Wal-Mart on Wednesday. Anyone that knows me, knows that I only go to that W place as a last resort. Of course one of the few times I pay the place a visit, they are rearranging the store, and I have to search high and low for the items I need. On Wednesday I also paid a visit to Carol’s Knitting Studio. Went in with the intentions to only purchase some Tofutsies yarn, but Carol had to show me all the new yarn she has. 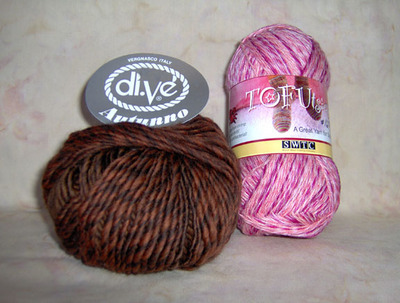 So besides the Tofutsies, a set of dpn needles and 2 skeins of Cascade “Di Vé “Autunno” yarn followed me home. I think I was the image of restraint, considering all the new yarn Carol has gotten in. The Chitin is naturally antibacterial. Bad picture. All I have left to do is weave in the ends and attach a button. The picture doesn’t show the subtle shading of the yarn. The Calorimetry only took one skein of yarn. So I’m left with one lonely skein, maybe I will make another one for someone else. For me the Calorimetry will actually work better than a hat because I usually wear my hair up. Tomorrow I’m going to “For the Love of Quilts” quilt show in Lawton. Plan on spending the day and catching up with everyone. Haven’t seen a lot of the guild members in well over a year. 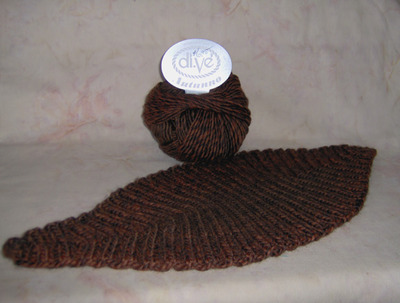 Also hoping that one of the vendors has some Angelina Fibers. I’m in the mood to play with fabric and fibers. Does it look like a sweater yet? While Ann and I were out yesterday we went by Carol’s Knitting Studio. 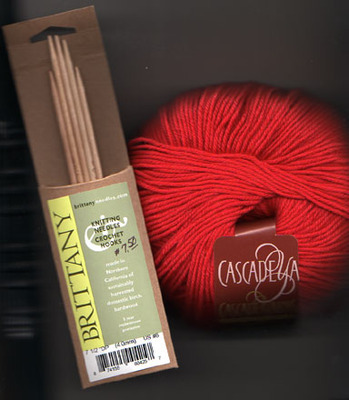 I bought the Cascade 220 superwash yarn and Brittany birch size 6 dpns I need to make a doggie sweater for Miss Josie. I saw this free pattern on-line and can’t resist giving it a go. It’s an aran type sweater with a biscuits and bones pattern. The only other thing I bought yesterday was a bench knife. Now I just need to get energetic and motivated to start holiday baking. Then drag out all the Christmas decorations and sort them into what to decorate with, keep, trash or donate.